We’ve been busy since the last update building out Wimba Island. Over 200 Tiled maps will make up the island so we have a lot of work ahead of us! Sebastien started off with a sketch of the island, then split it into images and imported them as image layers in Tiled. The first pass in Tiled was to do a quick fill of the terrain and allow us to see a rough version of the island and remove the image layers so that we could explore the island in-game. 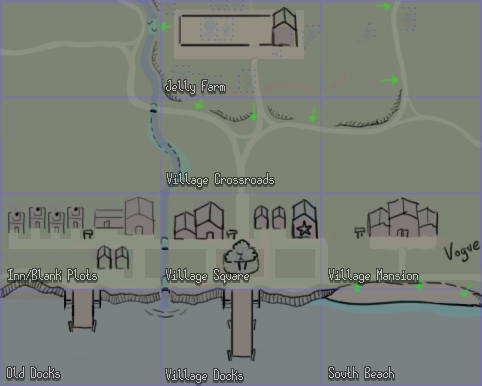 Now, we’re focusing on building out the village and plains where the game starts. After re-working a lot of the UI to improve readability on the Switch’s screen size, Tom is now starting to port the engine. This is going to be a lot of work but hopefully we’ll have a build running (in some form) by May 🙂 Sebastien will be continuing on the Tiled maps while also working on new tiles needed for locations around the island. As always, make sure to follow @alchemiccutie and @CIRCLE_Ent for future updates.